Introducing Applegate pepperoni. I am a huge pepperoni lover. Which is really funny to me because I know I didn’t like it as a kid. I like pepperoni so much that I buy it with my meat and cheeses fresh from the deli counter to put on my sandwiches. Even my boys think it is strange if I make paninis for lunch without pepperoni on them. A few months ago my mom was visiting and I remember the look she gave me when I said I wanted pepperoni pizza. She is not a picky eater, but she explained to me that pepperoni is full of nitrates and she wasn’t eating it. She’s probably right…in most cases. You know Applegate right? Applegate Natural and Organic Foods. I am a big fan. When I received an email saying they now make mini pepperonis I was super excited! They don’t just make one kind of mini pepperoni either…two kinds! I don’t know if there were more pepperonis on the pizza or more that we snacked on right out of the bag. Yum! I am so happy that there is a pepperoni that I won’t feel guilty eating. I think the turkey ones are a terrific idea and I will always be grabbing those first. We could not tell a difference in our taste testing! Both with just the right spice. Pizzas are a norm around here. Thanks Applegate for the delicious new addition to our house! Find Applegate mini pepperonis at Trader Joes, Whole Foods or maybe another store you can check here. 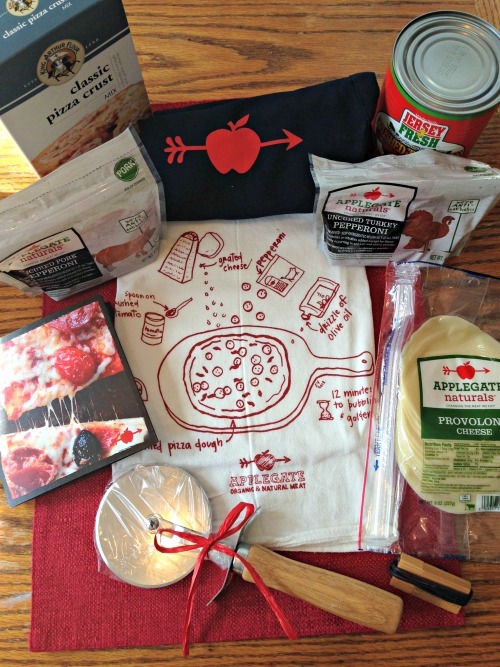 WIN an Applegate Pizza Party Kit! yes i do and i would love to make my own pizza. I love to make my own pizzas and I like to top them with pepperoni and bacon. thank you. We love pepperoni! and we love making our own pizzas! It's a great dinner to make with the kids. Pepperoni is my favorite!! We love making our own pizzas.... this would be fun to try out with my almost 3 year old. I love pepperoni, its one of my go to snacks. I do like pepperoni on my pizza but also lots of veggies like peppers, onions and mushrooms. We love to make our own pizzas, so everyone can pick the toppings they want. It's fun too! I love Homemade Pepperoni Pizza! I usually don't like pepperoni on my pizza, I prefer to eat it cold. But my hubby and kids love it on their pizza. I like homemade pizza because I like it well done and the pizza places never do it, even when asked. We always have pepperoni and mushrooms on our pizzas, we do not make them at home unless they are frozen. We use mushrooms and banana pepper rings with cheese, pizza sauce, and crust. That's it. It tastes great and not too many flavors conflicting. I love pepperoni, and we make our own pizzas quite often! I am not a huge fan of Pepperoni, but my kids are...except I don't choose to buy it because it is junk! I would love to try Applegates version! Pepperoni is my favorite topping for a pizza. I also eat uncured meats so this is right up my alley. I like bacon, peperoni, onions on my pizza..
My husband makes the best pepperoni pizzas! We love to make our own pizzas! We can individualize it that way! Yes I do like pepperoni. Not where I would want to make a sandwich with it!! Lol ! But I like it on pizza.. We have made our own pizzas before. Its Fun and delicious!! Ii would make a delicious veggie pizza. I Iike pepperoni the most! I like pepperoni but have not had it on pizza in years. It looks delicious! We like pepperoni and mushroom and onions on our pizzas. We have pizza EVERY friday and I always want pepperoni (with banana peppers ) I am going to have to keep an eye out for these mini pepperonis from Applegate b/c they are my fav. lunchmeat brand these days for nitrate free! We make pizza every week my son eats gluten free he has Celiacs the rest of us dont we eat a regular one so this looks so amazing to use in making pizzas. We prefer ground beef and mushrooms but will take pepperoni if that's all there is. We haven't made a pizza in forever! I do really like pepperoni, I usually make my crust homemade from ingredients at home and just put on it whatever we have around the house! I love pepperoni pizza...would love to make some goodness healthy pizza! I love pepperoni! if I win, I definitely will be making my own pizza. Thanks for the chance!! i love only cheese and pepperoni. We've never made our own pizza's, but it looks like fun! I love making my own pizzas! I get to pick whatever I wanna put on them- and I load them up! I love pepperoni and any other meat I can get my hands on at the moment. And of course- EXTRA cheese! I love pepperoni and I love making my own pizzas. LOVE pepperoni, and we make our own pizzas at least once a month. Yum! We love pepperoni here, we like our pizzas think crust, well done with light sauce and extra meat, how yummy can that be. I like pepperoni pizza. If I want to be a little healthier, I make onion and pepper pizza. We love making our own pizza ! always so good! That heart shaped pizza is adorable - such talent! Yes love pepperoni and I am starting to make our own pizza. I love making my own pizzas! I love adding all sorts of cheeses and vegetables! Love pepperoni and just wanna say the pizza looks delicious! Now I am hungry! We LOVE make your own pizzas! I like pepperoni and veggies on my pizza! YUMMY we LOVE Pizza at this house! yes, a pepperoni loving family here -- always no nitrate. Make our own pizzas all the time! I love to make pizzas... no pepperoni. 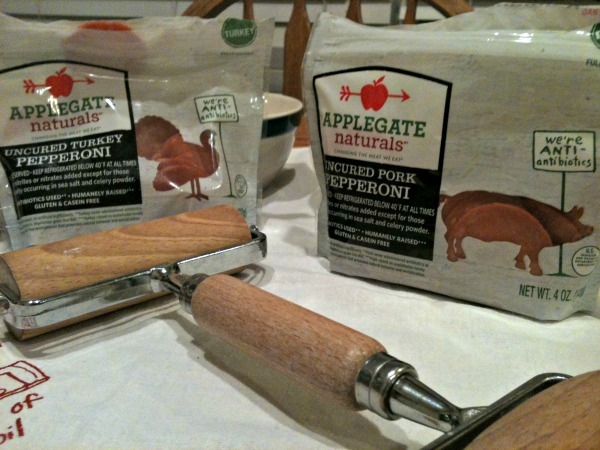 We love Applegate hot dogs and bacon - and we make our own pizza, but we haven't tried the pepperoni yet! we do homemade pizzas every friday with kids,they love pepperoni pizza and so do i! Pizzzzza. We get dough (normally) from Trader Joe's, and we love to add onions and olives! i love pizza! and applegate meats! my kids especially are obsessed with pepperoni. I love homemade pizza. We use fresh ingredients from the garden on them. I love pepperoni! I've been lazy about making my own pizzas lately though. I used to make a flat bread pizza using beer in the dough. Yummy. We haven't made homemade pizza in forever! We used to have a pizza pan around here somewhere but it's grown legs and walked away. we love pepperoni! and love applegate because it dont have to worry about the garbage in other products so i can feed it to my toddler! I love making our own pizza. I use frozen bread loaf and adding pepperoni, ground beef, ham, pineapple etc. We love homemade pizza night in my house. Everyone likes different toppings, I like veggies, hubby & kids like pepperoni. I love pepperoni! I too can eat it just plain. I love making my own pizzas at home! I love pepperoni pizza, but I have never tried homemade pizza. I'd love too though! yes, love pepperoni!!! love making my own pizzas, too! We don't make pizza's at home very often. But our family loves pepperoni! Thank you for the chance! 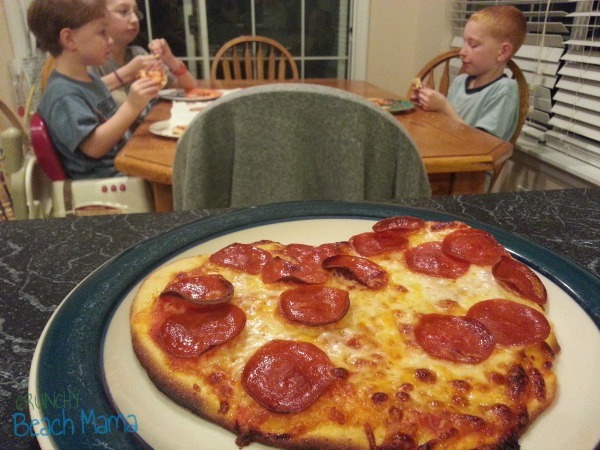 One of our favorite family dinner is homemade pizza, and yes i always make a pepperoni one for the kids! I Love Making Homemade Pizza, My Favorite Is Pepperoni With Extra Cheese! I do like pepperoni, but sausage is my first choice. I don't each much pepperoni either because of all the bad stuff in it. I'd LOVE to try Applegate's pepperoni though!! Thanks for the giveaway! I'm not a huge fan of pepperoni but my husband would eat it straight out of the bag. We love making our own pizzas! I love pepperoni! And sausage too. Oooo this would be fun to do with my nephew! I love me some bacon and pineapple pizza! Pepperoni pizza is my favorite...it's the kind I eat the most often. These look really yummy, and I like the fact that they are better for you. 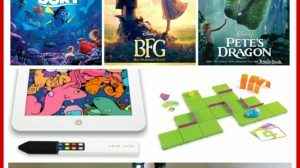 Thanks for the giveaway!! I make my own pizzas a lot. This is the only brand of pepperoni I'll buy my daughter. She likes the large ones and eats them as a snack. I LOVE pizza! Making it yourself at home is the freshest and always best! Thanks for the chance! I do love pepperoni. I also like to make my own so that I can decide on the portions and toppings. we lvoe making our own pizzas once to twice a month and we love goat cheese and pepperoni.. I really love pepperoni and sausage on my pizza, especially with with good cheese yummy!!!! I have two fave pizzas. Pepperoni with green olives and also pineapple with crumbled bacon. Mmm. I love pepperoni pizza! That looks so good! Pepperoni is definitely my favorite but I also like sausage, mushroom and pineapple! I love pepperoni. My favorite pizza is pepperoni, ham and black olives. I don;t eat pepperoni but I love veggie pizza! Pepperoni is my favorite but I also like sausage, mushroom and onions. I sometimes like pepperoni on my pizza, but I usually just have vegetables on my pizza! I am vegetarian so I do not like pepperoni, but I love making cheese and veggies pizzas! I absolutely adore pepperoni! That is usually all I want on my pizza. YES! I love pepperoni on my pizza. I especially like uncured pepperoni. It just tastes better and it's better for you. I also like making my own pizza. We like pepperoni pizza. Our family favorite to make is bacon pizza. I do love pepperoni but we have not made our own pizzas in a long time. I would love to start doing this again. I love pepperoni on my pizzas, along with mushrooms. I do make my own pizza with hamburger & Cheese topping, my family loves it. I love love love pizza. Pepperoni, sausage and ham.. I LOVE Pepperoni. I usually have to buy an extra pack because I can't keep my hands off of it!! 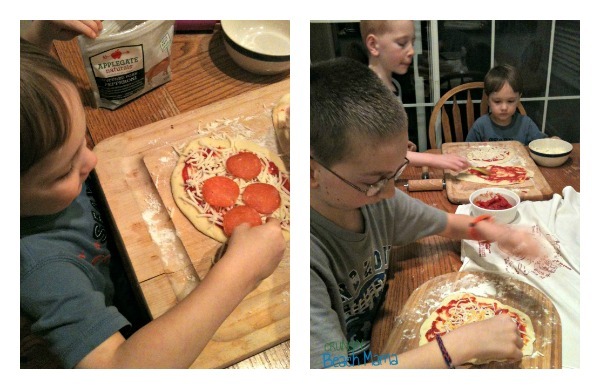 Homemade pizza nights is one of the kids favorite in my home!! I like pepperoni, I really love lots of cheese on my pizza. I do like Pepperoni but my favourite topping is diced or sliced tomatoes cooked on the pizza. Tomato and feta or tomato and goat cheese would have to be my absolute favourite. Add onions and it's definitely heavenly. Thanks for the giveaway. I do not like pepperoni but it is my hubbys favorite! I love pepperoni but also love the margherita pizza! I rock at making my own pizzas and love love love pepperoni!! Good ol' pepperoni is my fav! I love pepperoni and my own canned pepper rings on mine. I wish I had a better crust than the one I make though. I am so strange - I love the big sticks of pepperoni and eat chunks of it with my dog but I hate it on pizza and usually just have veggies on mine. I love making pizzas and we definitely have to have pepperoni and lots of cheese. Thanks! I love pepperoni!! I also love ham and pineapple pizza! I love Pepperoni and I love to make my own pizzas! Thanks for the giveaway… we would like to try that Natural Uncured Mini Turkey Pepperoni !